When I think of wines from Bordeaux that are actually underpriced, not many come to mind these days, but one is Chateau Raymond Lafon, made from grapes grown among the choicest spots in the appellation. But five years old when the 1855 classification took place, it was not included. Which means, roughly, if you want to visit Paris in 2011, do you seek out a tourist guide from the 19th century? 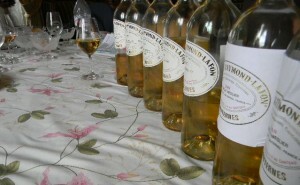 Certainly many of the classified wines are excellent in Sauternes. But the level of quality at Raymond Lafon easily matches the best of the premiers crus, and certainly surpasses the second crus. I have known the current owners, the Meslier family, for over 10 years now, and although much has changed in their lives, the quality of the wine continues to obtain deserved critical acclaim, from France and Germany to the US and beyond. So it was with great pleasure that I found myself invited to dinner at the estate with the famous French wine critic Bernard Burtschy (who writes for Le Figaro). We enjoyed a lovely vertical of the Sauternes with Pierre Meslier, daughter Marie-Francoise and son Jean-Pierre Meslier, and two other friends of the family. Tasting notes (wines I like in bold, even more in bold and red and the best underlined). 2010: This barrel sample did better than in April, as it revealed real freshness and richness. I began to wonder if indeed the 2010 will surpass the already fine 2009. 2009: Richer and more full bodied than the 2010, but showing marvelous balance between acidity and opulence, this will turn out great in bottle. 2007: Here we have one of my favorite recent vintages, which I think surpasses the 2005. It has such a polished elegance to it, with body and botrytis spice, but one has a far easier time drinking this. It just seems to beckon another sip. 2005: I have had this on multiple occasions over the years, and I like it for its richness. 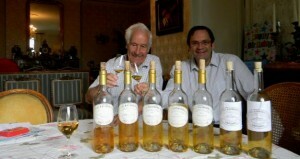 It is certainly better than other Sauternes 2005 which sometimes seem too rich for their own good. There is a lot to like, from the yellow peach and spice to the broad palate feel ending in a tonic fashion, showing that the acidity is there. 2002: Here a vintage that is forgotten between the legendary 2001 and the media grabbing 2003. Somewhat like the 1996, the 2002 reveals intriguing beeswax and lanolin like flavors, with botrytis spice, conveying freshness and poise but also the expected richness – again this is more my style, more 2007 and less 2005. 1988: What can one say about this? I had to have another glass. What balance, what elegance, what richness! The flavors were very complex, from jasmine and black tea to white peach and orange blossom. A beautiful Sauternes. I confirm what you wrote, this splendid dinner with this wonderful, magical vertical of Chateau Raymond-Lafon will be something I will never forget. We had a great time thanks to the warm hospitality and generosity of the Meslier family, such nice people whose wine is in their image. Just a little anecdote, 2 days later I was the lucky one who had the last glass of the 1988 Sauternes (with the tasty Stilton you had brought. Yesterday I read the Figaro article written by Bernard Burtschy and was surprised that he did not even mention the name of Chateau Raymond-Lafon! Anyway, many thanks again to the Meslier family and we may meet again, who knows ? It was great meeting you Mireille. And I am glad that you had the last glass of the 1988 ;-). I am sure our paths will cross again! Thanks for writing. Salut Carl! Ca fait trop longtemps! Au fait je crois que Coutet fait de plus en plus un bon travail. Le 2005 est fin mais si tu as le choix, je prendrai plutôt le 2007! I bought a case of the 1983, 20 years ago based on the reviews of excellence and value. Have consumed a bottle now and then and gifted several. Opened a bottle last night for my daughter’s birthday. At first wiff, I detected a chorine bleach smell. “Must be the glass,” I thought. Changed and rinsed glasses with spring water. Second try, still there. The chorine smell and even taste persisted and was backed by a rubbery taste. My daughter would not drink it. After an hour or so of aeration, it was drinkable but very dull. Any other reports on this? j’ai ici un vine du ‘chateau ramond-bernard, medoc du 1976.
tu connait ce vins la? Merci pour votre lecture! Je ne connais pas Château Ramond-Bernard, Médoc 1976. L’année était très chaud, voire trop chaud, et donc il y avait un blocage sans doute de la maturité. A mon avis, le vin est trop vieux pour vraiment l’apprécier, mais souvent les vins de Bordeaux nous surprennent. Essayez donc et merci de me dire comment il aurait été.